The chances of anyone randomly stepping inside these blue alien giants are somewhat slim. One has to first kayak into the right spot at the Mendenhall Glacier in Alaska and then ice climb over it to descend into the caves. It’s a tough sightseeing tour but one that won’t be available in years to come. The ice caves only exist because the glacier itself is melting but while they are here, you may as well enjoy them. After your trip of nature admiration, do what you can to stop global warming (take that, Trump). While not many people would travel anywhere to see squishy worms, these guys are worth it. 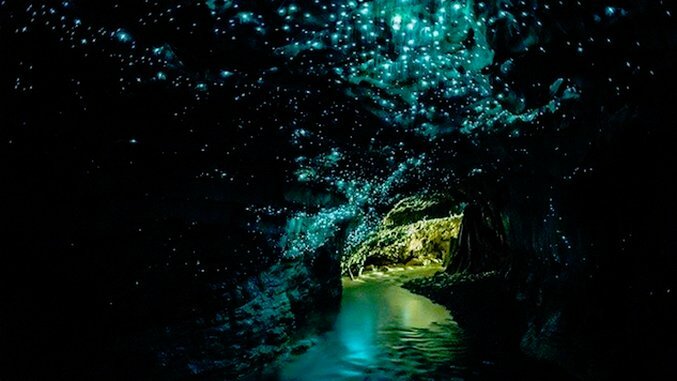 A cave at the North Island’s Waitomo has a population of tiny, strange blue creatures that glow in the dark. The Arachnocampa luminosa, or glowworms, are alien to the rest of the world because they only reside in New Zealand and put on a spectacularly ethereal light show for anyone who visits. While gliding down the cave river under the starry luminescent light of the Glowworm Grotto, you cannot help but feel a sense of supernatural presence. Rocks may not sound that exciting, but they are at the Giant’s Causeway in Ireland, where the rocks look too surreal to be man-made but too perfect to have been carved by nature. If rock travel hasn’t been invented yet, this causeway worthy of a giant could start that trend. A forest on the other side of the world might not initially sound like a must-see destination but if there ever were a grand, futuristic and naturalistic sight for sore eyes, the Zhangjiajie National Forest Park in Southeast China would be it. The eerie park is a place where Avatar goes on a space odyssey with King Kong without disturbing the beautiful nature and characteristic pillar-like formations. It’s the perfect stand-in while we wait for the package deals to Mars and Venus. In 2000, humans boldly went where no human had ever been before and found a city of crystals underneath the Naica area in Mexico. Discovering something as spectacular and unique as this crystal cave must’ve been pretty high on the surreal scale of sightings. Who would’ve guessed that in order to find more otherworldly locales, one needed to dig deeper instead of going up into the space? Sadly, the cave, which houses some of the world’s largest crystals ever found, isn’t exactly a tourist attraction. Located almost 1000 feet below the surface, the cave boasts an extremely hot and humid temperature of 112 Fahrenheit and without appropriate protection, can only be admired for a few minutes. Most of us can say we have experienced some unique, weird and one-of-a-kind travel adventures, but how many of us can say we have seen something out of this world in worms? Or ice? Sounds pretty mundane but trust us. These places are the opposite of everyday. Even though Mars and Venus are sadly out of reach due to today’s space travel realities, that doesn’t mean that space-like exploration is completely out of the question. Our planet is bursting with strange, alien-looking wonders and locales—you just need to know where to look, have the guts to go, and leave the rest to your imagination. Elina Eronen Piper is a London-based Finn who binges on new travel experiences, snow-capped mountains and salty liquorice. Follow her and her adventures on Instagram.